Both my parents were Holocaust survivors from Poland, and they raised a religious family rooted in Chasidic teachings. I attended a Lubavitch schools for girls in Boston, where my future husband – also a child of Holocaust survivors – was enrolled in a Lubavitch yeshivah. We began dating as students at Yeshiva University and got engaged. At that time – this was in 1974 – my father was sick with stomach cancer, and the doctors were not giving him much longer to live. Coming from a Chasidic background as he did, my father urged us to go see the Lubavitcher Rebbe to get a blessing for our marriage and, while there, to bring up his condition. 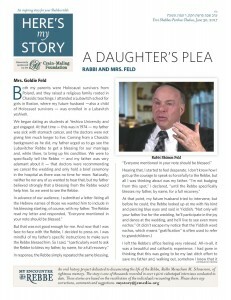 We were to specifically tell the Rebbe – and my father was very adamant about it – that doctors were recommending we cancel the wedding and only hold a brief ceremony in the hospital as there was no time for more. Naturally, neither he nor any of us wanted to hear that, but my father believed strongly that a blessing from the Rebbe would help him. So we went to see the Rebbe. I left the Rebbe’s office feeling very relieved. All-in-all, it was a beautiful and cathartic experience. I had gone in thinking that this was going to be my last ditch effort to save my father and, walking out, somehow I knew that it worked. Indeed, my father lived to see us married. Although he was very weak and very sick, he marshaled enough strength to come to the wedding. And he lived long enough to see our first child born. He passed away a number of months later, two weeks before the birth of our second child. Altogether, he lived a year-and-a-half longer than the most optimistic prediction of any of his doctors. So it was extraordinary that he got that extra time. And I have no doubt that the Rebbe’s blessing played a part in making that possible. Because I had attended the Chabad yeshivah in Brooklyn, I got to meet with the Rebbe every year for my birthday. These were very brief meetings, with the Rebbe typically blessing me to succeed in my religious studies as well as my secular studies. But each encounter was special. Each time, the Rebbe made me feel as if I was the only person in the world who mattered. There was nothing like that feeling. My wife has told the story of our audience with the Rebbe when she requested the blessing for her father’s recovery from cancer. The exchange between them – as I remember it – was like a tennis match. I turned as white as a sheet, because I was astonished that she was speaking to the Rebbe in such a forceful manner. I just couldn’t believe what I was watching – it was surreal. Indeed, I was so shocked that I was at a loss for words. But she held her ground and received the blessing she sought. As a result, her father lived for quite a while longer than the doctors predicted. He was being treated in Boston by the greatest physicians on the planet, and they all said he had three months to live at most. There was absolutely no way he would live long enough to see us married. It was a three-pronged blessing, and all three things came true. Rabbi and Mrs. Shimon and Goldie Feld live in Teaneck, New Jersey. They were interviewed at the My Encounter studio in Brooklyn in March of 2016.